To help ease the suffering of thousands of families uprooted by Hurricane Florence, Melaleuca delivered a semi-trailer truck stocked full of its Attain and Simply Fit snack bars to the American Red Cross in North Carolina. 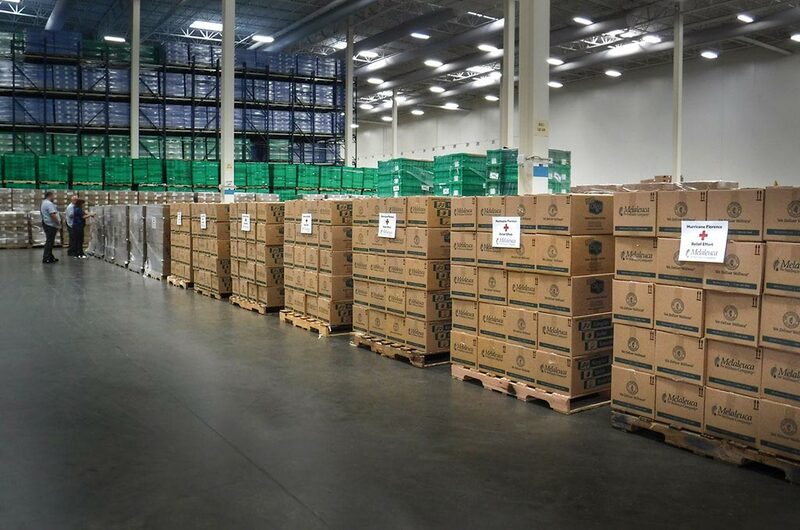 Knowing Melaleuca’s desire to provide relief during times of disaster, the American Red Cross asked specifically for these bars, for which they had an immediate need. Melaleuca mobilized on the spot, quickly fulfilling the relief organization’s urgent request. The 91,500 snack bars were delivered to a warehouse-turned-Red Cross staging center in North Carolina located 25 minutes south of Raleigh. From there, the bars are being disseminated to thousands of victims taking refuge in the 200 Red Cross shelters throughout the region and to first responders and emergency volunteers. As the floodwaters subside, victims will begin returning to their neighborhoods to assess the damage to their homes. When they do, the American Red Cross will have emergency response vehicles on scene to hand out more of Melaleuca’s snack bars, along with bottles of water. Melaleuca had been monitoring Hurricane Florence for weeks and coordinating with senior officials at FEMA, the U.S. Chamber of Commerce and the American Red Cross to determine how and where it could make the biggest difference. Due to the widespread nature of the hurricane’s destruction, Melaleuca teamed up with the American Red Cross, which is known around the world for its emergency response. A longtime supporter of the American Red Cross, Melaleuca serves on the organization’s board of directors for the Idaho and Montana Region and maintains contact with its national headquarters. As a result, the American Red Cross has become familiar with Melaleuca’s products and track record of immediate response during times of catastrophe and natural disaster. After assessing the most critical needs in areas hit hardest by Hurricane Florence, the American Red Cross’ in-kind donation team specifically asked Melaleuca for 90,000 of its single-serving snack bars. Employees at Melaleuca’s production plant in Knoxville, Tennessee, sprang into action and had the bars boxed and loaded onto a truck in a matter of hours. Hurricane Florence made landfall in North Carolina on September 14 and flooded much of the Southeast in a matter of hours. Up to 36 inches of rain has fallen in some areas, and hundreds of thousands are still without power. Melaleuca bathed the entire exterior of its Global Headquarters in blue light as a statement of solidarity with police officers.